Think about this situation. Imagine that you are client of any wealth manager and the staff sends you a report about the best chances for your investments, with recommendations and comments to obtain the best performance. Then, you talk to a friend, who is also client of the same wealth manager and you both comment about the report. You discover that both reports are personalised and are not the traditional recommendations’ standardised reports that these entities publish regularly. Each one have personalised information and you both discover that the entity has used your full data to design the best report to meet your needs. Then, you explain your friend several changes in your investments. Both have the same risk profile, but your portfolios (and the historic operations) have nothing to do to another. The example could be larger, but it is enough to introduce the changes that we will live soon in the wealth management branch. The expression behind these changes is artificial intelligence. Shortened as AI, it is not a Steven Spielberg film. It is far from fiction, because it is reality. The learning capability of machines increased exponentially in the last years and the soar will keep on. There is a combination of big data analysis, natural language and machine learning. Big data analysis provides the capability of learning better not only about the customer, but also about any trend that goes around him. Natural language allows machines to interpret and generate spoken and written language. Machine learning uses algorithms that can learn and make predictions on data. This will be the mix that we will see growing in the next years. The transformation will be deep in the whole financial sector. Currently, a 26% of assets and wealth manager firms already use AI to inform the next big decisions, according to PricewaterhouseCoopers. Money is flowing increasingly there, because all agree that this will be the next step for fintech business. 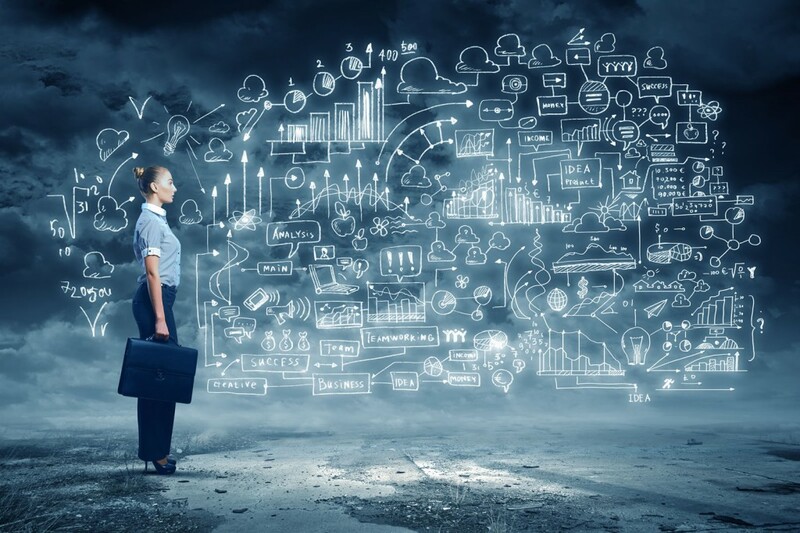 For instance, natural language processes will help comply better with regulations, as machines will learn immediately the changes and adaptations will be easier in platforms. This will also has a very relevant collateral effect managing risks more efficiently. The client will obtain a high-improved user experience with new interfaces. The advisor tasks will focus in asset gathering and portfolio monitoring. They will also become more responsive to client needs and increase the added value of their services. Robo-advisor in the first deep step in this change. There will be further changes with a greater automation. Robo-advisors and human advisors will experience several transformations in their tasks and roles against clients. They, the clients, will be winners and the only losers will be entities (not only human, also fintech) that will not adapt to the new wave. This entry was posted in News and tagged artificial intelligence, big data, fintech, machine learning, natural language, Robo-advisor, wealth management on May 25, 2017 by Oscar Garcia. 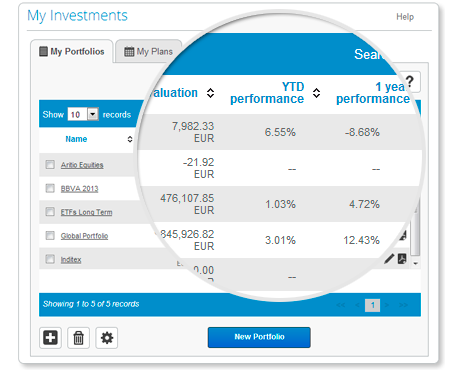 T-Advisor, your investment management suite, evolves with its new 3.0 version. This new version offers substantial improvements to make finances easier and more accessible for all. The platform keeps its self-directed management model, but it adds new features focused on the social side. Our aim is that you feel part of a community to share and exchange ideas about finances and investments to improve your results. First of all, we changed the design to be more user-friendly, with clean and flat colours, a structure easy to switch into grid or list to view the elements and easy-to-find buttons. Secondly, you will find several relevant changes in your portfolios. In order to promote the community and the exchange of investment ideas, new created portfolios are public by default, except of you prefer to switch them into private just with a click. On the other hand, old existing portfolios are private by default, although you can switch them into public. In any case, community members will view only returns as a percentage and the structure of the public portfolios. They never view balances or specific assets. You have received a default nick that you can change anytime. You may upload a picture to customize your profile. You will be reported about your position in the community users’ ranking and the medals that you obtain. New T-Advisor has implemented some little events to motivate the users to invest and enjoy the platform tools. You will be reported about your followers and you will be able to exchange messages with them through the “Social” tab, where there is a wall to post comments. We have also implemented notification alerts and messages. For instance, you will receive an alert when someone sends you a message or you get a new medal. 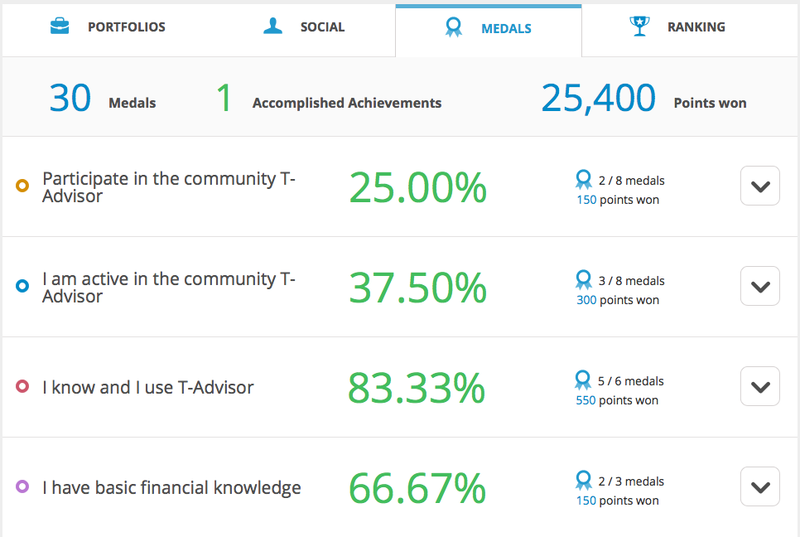 New T-Advisor has implemented a list of handicaps to obtain medals in order to motivate the users in their investments. We took the so-called “serious games” as a reference to improve the financial education of the T-Advisor community and offer a different way to enjoy the investment activity. We had not put aside main issues, as obtaining good performances. However, users will be able to focus their decisions in a more pleasant way. 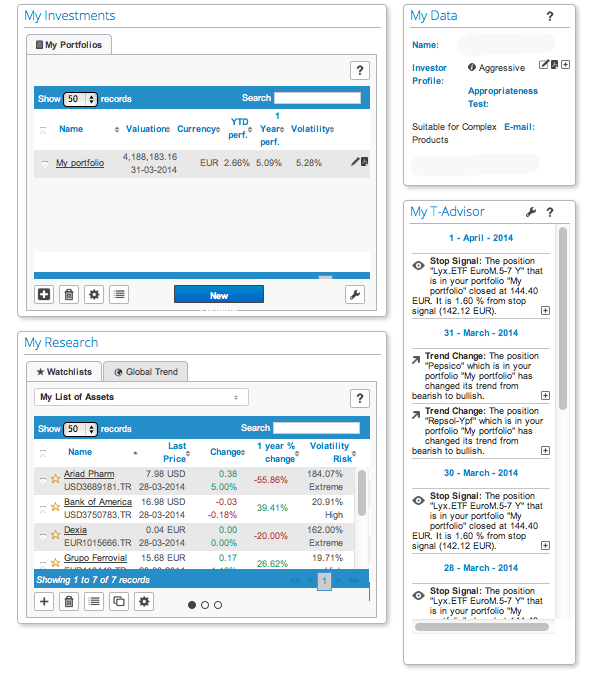 We will publish some posts in the next weeks to explain all changes in the new T-Advisor 3.0. We invite you to enter, browse and discover all the new features. We hope that they will be useful for you and improve your investment experience. Take part in our community! This entry was posted in Discover and tagged Community, gamification, Robo-advisor, Self-directed, T-Advisor on May 8, 2015 by Oscar Garcia. Robo-advisors are already part of the financial landscape. Many companies have appeared and grown in this field, creating a new player through technology and low costs. Some traditional financial players look at them with reluctance or even fear. But, what about changing the foe into friend? Technological developments are expensive and it is not so easy to obtain profits in a short-term. However, the chance of implementing a flexible platform in your own system sounds more interesting. 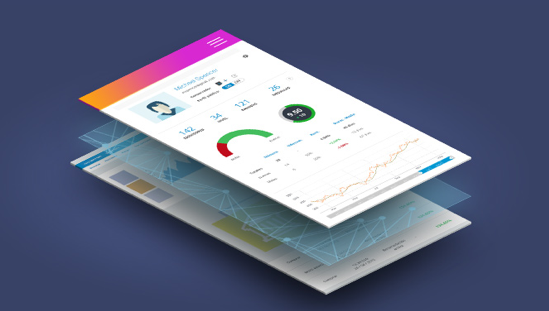 T-Advisor was conceived with a double purpose: a way for common people to manage their own finances and a platform for institutions and advisors to manage their clients’ investments. Think about that: you offer an easy, usable and flexible solution for your clients, who feel the investment experience. They will have the perception that they control their investments. They will feel as the owners. But behind that, the institution or the advisor is providing a high value added service. Then you are getting the foe into friend: the robo-advisor is part of your strategy. The idea is clear. If you give tools to your clients to let them be more independent, they will trust you more. The more they trust you, the more they hire other services from your company. This virtuous circle comes from a technological solution. That is why robo-advisors are a real business chance for financial institutions. 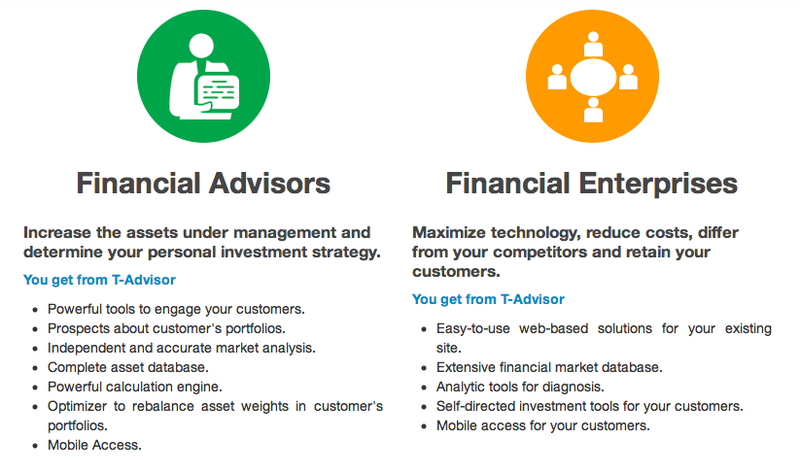 T-Advisor is a solution for advisors and financial institutions. They do not need to develop anything new, because T-Advisor is the answer. The platform can be easily implemented and adapted in existed structures with real success. Many clients are already enjoying our solutions. This entry was posted in Discover and tagged financial institutions, Robo-advisor, solutions, T-Advisor on December 11, 2014 by Oscar Garcia. It is possibly the trending topic in the advisory world: the fight between humans and robots for the business. We hope that the fight will not end as in “Terminator” or “Matrix”. In fact, there is no reason to fight. Robo-advisors appeared some years ago to stay. They are not a kind of fashion trend, but a solution for a specific client’ profile. Moreover, they were not created to remove human advisors from the market, but there are some points of convergence between both. First of all, we have to establish a categorization: not all robo-advisors are the same. Some companies have developed a pure automatic tool and the client has to do everything by himself or herself. Others have these tools and an online human advisor support. Finally, there are financial entities with online investment tools for their clients. In any case, all of them have discovered a new world for common people: they can monitor steadily their investments. What are the main advantages of the robo-advisors? The fees are low and transparent. You pay for a package with a list of features. You know every time what you are paying for. Technology also reduces the costs. This is a pressure for human advisors, but it has a positive effect in this competitive market, as the less skilled will be out soon. Technology connects with the new generation. Older people used to opt for human contact, but Millenians are linked deeply with smartphones and tablets. Robo-advisors fit with their way of connection with the world. There is an improvement of the user experience. Clients have a 24/7 service to monitor their investments, to make changes and to manage their portfolios. Little investors have a chance. Traditional advisors accept only investors from a specific volume of assets. Little investors are not profitable for them and have found in the robo-advisors a way to control their wealth. In fact, robo-advisors have made finances more democratic. Clients feel the control of their investments. They access to a wide rage of organized relevant data with many helps to understand the concepts. There is no personal treatment and robots do not really know the wishes and aims of the clients. Well, we have to point out that robots do not appear by themselves, but they are made by humans. Developers are experts in finances with a long experience in investors’ needs. Of course, there is no voice behind the final product. Robo-advisors will show their weakness in a bear market. Let’s see, when it comes. These automatic systems have alert tools to warn the investor about a change anytime. What about human advisors in bear markets? We are sure that many people are not very happy with several of them. And other question: let’s think that there is a sudden stock fall and an advisor has to react for his, say, 10 clients. How fast has he to be to solve these 10 problems? The risk profiling is bad. If it is bad, it does not comply with the legal requirements, so it has to be warned. These companies design risks questionnaires to effectively comply with the rules. Again, there are complementary points: different segments, support robot-human advisor… Time and market will drive future developments, but, in any case, there is place enough for both or a combination. The client will decide the best option that fits his or her needs. This entry was posted in News and tagged Fees, Millenians, Robo-advisor, User experience on November 12, 2014 by Oscar Garcia. It is interesting how the discussion has developed in the lasts weeks about the new wave of online advisoring services. Recently known as “robo-advisors”, these services offer the users a range of professional tools to manage by one-self the own assets. The discussion points out how it will change the advisoring industry. We wonder if the industry didn’t change yet. Some writers speak about the “Millenian effect”, naming the current generation who has entered the asset management services and demands other solutions, totally different from the older ones: more interactivity, more personal decisions, more own information and availability of resources to take more independent decisions. We have already commented about it. There is also an economic reason: robo-advisors have a quite lower price in comparison to traditional advisors. Somehow, there is a lot of fear amongst these professionals, but the question is: why not to make the fear into an advantage? For instance, T-Advisor combines solutions for individuals and for professionals, giving the chance to both to speak the same language. It is not absurd that people who share the same screens have more confidence to each other. Elliot Weissbluth recently commented that these online services mean a disruption for the industry, but it should not be seen as the end or the total substitution of the human advisors. On the contrary, it will help separate good and bad professionals. Think about that: your advisor makes you lose money, he or she does not appear very skilled, but this person receives the monthly fee from you. Why to pay for it, if you have cheaper online services with advance and professionals tools? (Tools, as this professional should manage…). However, good professionals will not suffer from these robo-advisors. Their customers will not risk changing, if they have their profits. One more reason for these online services: democratization. By now, people with a small portfolio think twice to pay an advisor, but the online fees are quite lower. This is a chance for them, because they can manage their assets and try to get the highest earnings for their goals. This entry was posted in News and tagged Elliot Weissbluth, Millenians, Robo-advisor, T-Advisor on April 1, 2014 by Oscar Garcia.